Congrats Liz and Phil -- you made it to your "Blue Sapphire" wedding anniversary! 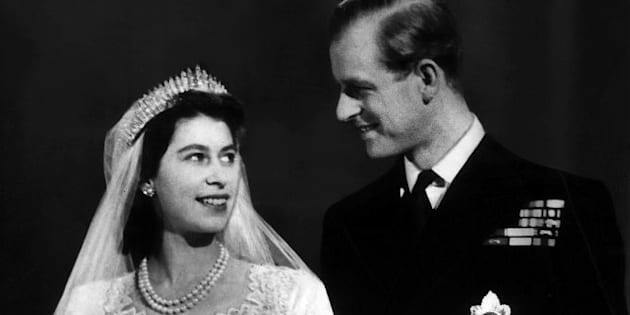 The Queen and her consort, Prince Philip, were married 65 years ago today. The pair wed in Westminster Abbey on November 20, 1947 -- that's the same cosy chapel where Will and Kate tied the knot last year. The two royal lovebirds, aged 86 and 91, met while he was serving as a naval officer. There's even footage of the very first moment they met, when Elizabeth was just 13. Their secret to staying together for six-and-a-half decades? "It is not unknown for the Queen to tell the Duke to shut up," Her Majesty's former private secretary told The Mirror. According to aides, the two will spend the day quietly together at Buckingham Palace. And fun fact: Queen Elizabeth II is the first British monarch to achieve this marital milestone. Take a look back at Queen Elizabeth II (then Princess Elizabeth) and Prince Philip's Wedding Day.